Ramos Roofing can save you energy costs via our ENERGY STAR® rated roofing products. We utilize preferred green roofing brands in Colorado offering reflective technology roofing shingles that help reduce temperatures in your attic. These green roofing materials save energy by reflecting the sun’s rays which keeps roofs cooler, resulting in an energy efficient and comfortable living space in the home. You not only get energy savings but tax credits up to $500 when you install Colorado green roofs! Get on board with the green revolution with ENERGY STAR® rated roofing shingles. Your Colorado home will stay cooler in the summer months, saving on air conditioning costs. Our preferred roofing brands for Colorado green roofing include Owens Corning, GAF, MonierLifetile, and others. 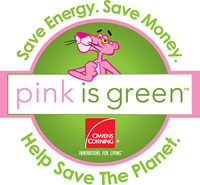 Owens Corning helps save energy costs in Colorado where we have substantial sunlight with their ENERGY STAR® rated roofing products. These include Owens Corning Duration® Premium, Duration®, Oakridge® and Supreme® shingles in Shasta White and Duration® Premium Cool Shingles in Frosted Oak, Harbor Fog and Sunrise. All of these roofing models are ENERGY STAR® rated for their ability to reflect the sun’s rays and keep roofs cooler, resulting in a more comfortable Colorado home. You get both potential energy savings and tax credits when you install GAF Timberline® Cool Series Shingles. With GAF reflective technology roofing products you can join the green revolution. Their Timberline Cool Series roofing shingles are highly reflective shingles that help temperature reduction your attics, resulting in your home will staying cooler in summer and reducing air conditioner costs. GAF’s Timberline Cool Series shingles use specially designed roofing granules that reflect sunlight more than traditional shingles. 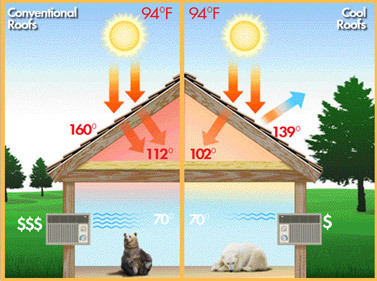 The transfer of heat to your attic is minimized, allowing you to keep your home cooler in the summer. Certainteed. Featured Roofing Green Products from Certainteed include Composite Slate Shingles, Solar Reflective Asphalt Shingles, and Solar Reflective Roofing Membrane systems. As an advanced hybrid roofing material, Landmark Solaris combines the traditional beauty of asphalt shingles with the ecological benefits of cool-roof technology. The result is a long-lasting ENERGY STAR® rated product. We provide complete green roofing services in Adams, Arapahoe, Boulder, Broomfield, Denver, Douglas, El Paso, Jefferson, Larimer, and Weld Counties in Colorado. See our Roofing Service Areas.